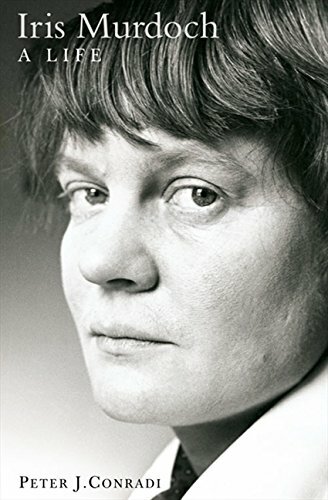 Iris Murdoch (1919 - 1999) was an Irish-born author best known for her complex but entertaining philosophical novels. Dame Iris, as she was known since she was made a Dame Commander of the Order of the British Empire in 1987, won the Booker, Black, and Whitbread (now Costa) prizes; had one book on the Modern Library's list of Top 100 Novels of the 20th Century; and also wrote poetry, plays, and books of philosophy. I am working my way through her novels, which are listed below in publication order. Those I have read are in red; those on my TBR shelf are in blue. Please feel free to leave comments with links to your Murdoch-related posts and I will list them here. The Sea, the Sea is my favorite so far. It is a remarkable novel and really, really wonderful. A Fairly Hounorable Defeat was also very good, and sticks in my head all the more now that I read Claire Massoud's The Emperor's Children, which I think was a rip-off of Murdoch's earlier book. I love Iris Murdoch. You have a treat in store for you with The Bell, it's an amazing book. 'Iris' by her husband John Bayley, is worth a read too. I have yet to read Murdoch--that's a somewhat daunting list of books, but I'll be interested in reading yor reviews. Sam: Thanks for the recommendation. I will read The Bell next. I have the biography too, but want to read a few more novels first. Jane: And her books can be a little daunting as well, but once you get into one of them, it can really grab you. How interesting. I've never heard of her. I have never thought of posting author bios unless I am doing an interview or as part of a review. I like it! She's my favorite writer. It's so hard to single out one book as my favorite, but if I had to, I'd choose The Bell. Enjoy your journey through the books! I think her early work is brillant, some of her later work I find a bit dry and hard going, like The Book and the Brotherhood. I love the novels that have strong literary allusions and magical/mystical elements to them, they're the most imaginative I think. The Green Knight and The Flight from the Enchanter are certainly among my absolute favourites. As you know, I love Ms. Murdoch. The year I spent in college reading her books from first to most recent in order was one of the best reading experiences of my entire life. I also love The Sea, The Sea, but am equally fond of A Severed Head. I haven't seen any of the movies or read any of the books about her because I like the essence of her that is contained in her work. Dana: I like to keep track of my progress working through the bibliographies of my favorite authors. So I do these kinds of posts and then link to them on my Favorite Authors page and over in the right hand column. Part of my list compulsion! Unknown: The Bell is quickly moving to the top of my TBR list. Chell: Interesting perspective. I've jumped around with her books, chronologically, but I haven't read enough of them to draw any big conclusions. I have the Green Knight, so it is one I will get to sooner than later. Caitlin: What an incredible year of reading! I would love to immerse myself in an author's work like that. But of course I never will because of all the other book temptations.